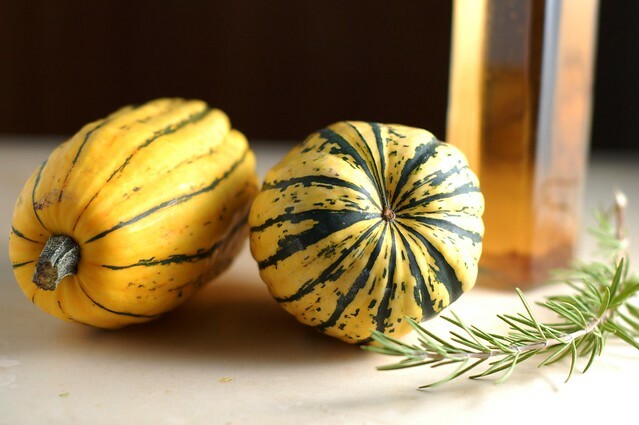 This is a perfect fall dish -- apple cider, delicata squash and savory herbs, cooked down into tasty, glazed bites. You can choose to peel the squash (it will cook a little faster) or leave the skin on, it's perfectly edible. Don't forget to save the seeds for roasting. They make a very tasty, nutritious snack. Here are the simple instructions. You start by sauteeing the herbs in butter, then add the squash and cider, a splash of vinegar, a little pomegranate molasses, a sprinkle of salt and simmer until the liquid has been absorbed and forms a light glaze. Taste and adjust the seasonings, as needed. The recipe below is adapted from one I found on Epicurious. 1. 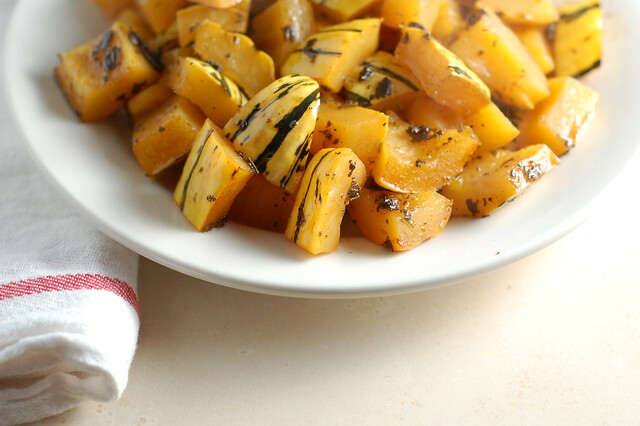 Depending on what squash you use, you may need to peel it but delicatas have fairly tender skin cooked. If you're not going to peel the delicatas, rinse them thoroughly then cut them in half length-wise and scrape out the seeds with a spoon (I use a grapefruit spoon to do this 'cause it's got little teeth.) 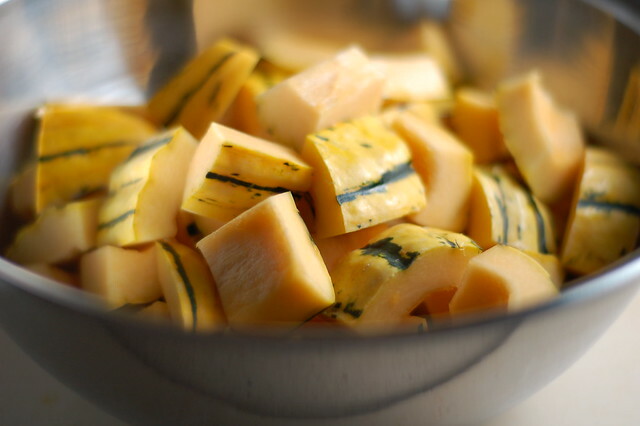 Cut the squash into 1-2-inch cubes. 2. Melt the butter in a large frying pan over medium-low heat, add the herbs and cook, stirring for 3-5 minutes until the butter begins to brown. 3. 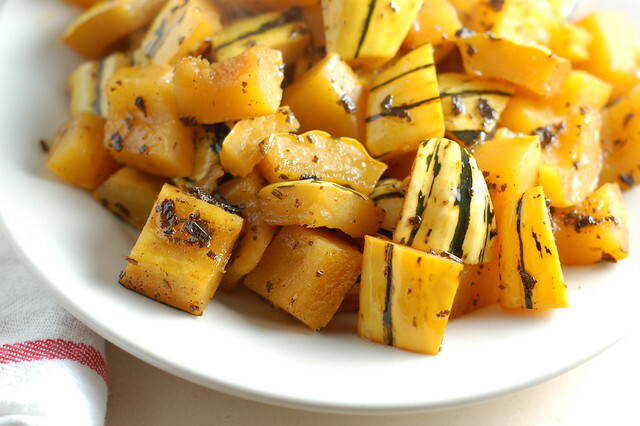 Add the squash to the skillet, then the apple cider, water, vinegar, molasses, and salt. Cook over medium heat, stirring occasionally, until the liquid reduces to a glaze and the squash is fork tender - about 20 to 30 minutes. Taste and season with pepper and salt, as needed. Wonderful job on this recipe! This is my first visit to your blog--I read several of your posts--all were enjoyable--thanks! Thanks so much! Your blog is great, too. This recipe is from Epicurious, with your adaptations. Please remember to cite your sources so others can refer back to the original recipe and to avoid plagiarism! thanks for your comment. I trust that you're right about the recipe's source although since I wrote this post back in 2007, I do not actually remember :) I have added a note to the post.